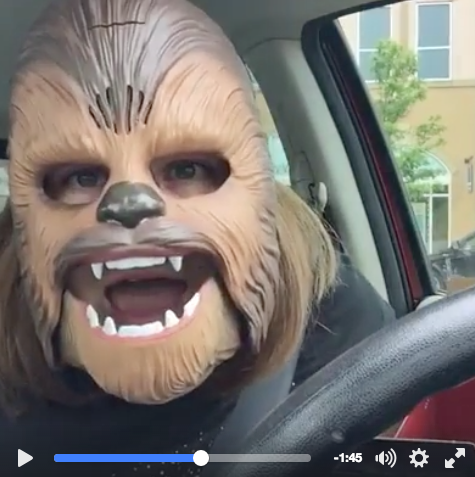 The viralicious Chewbacca Mom video shows the power of accidental viral marketing for brands. The selfie video, posted on May 19, of a super-excited Mom describing how she went to Kohl’s has been seen by 136,491,983 people as of 11:30 a.m. E.T., and is the most viewed video in Facebook history. The video has been shared on the Facebook platform over 3 million times as well. There are also millions of views from reposts of the video on YouTube. The Mom, Candace Payne, starts off in her video saying, “I’m really excited to show you something I got!”, clapping while she says it. You’ve probably seen it but if you analyze the video as a Kohl’s marketing message it just couldn’t be scripted better. There’s real genuine excitement by an obvious frequent customer who loves Kohl’s, dramatic buildup, a factoid illustrating great service by Kohl’s in taking back a previous purchase and there is humor which is what caused the video to be a viral sensation. It’s also great for Facebook because the attention it has received has certainly got the attention of brands. Facebook videos, especially Facebook Live videos, can be an extremely effective form of marketing. If brands didn’t get this message before, they have it now! Candace posted on Facebook about all the attention and with her new mega following of 551,000 people, this packs quite the marketing punch too! Today has been a whirlwind. I’m grateful for every kind word and comment even if I haven’t replied. Y’all. OVERWHELMED with gratitude. Let’s keep belly laughing again and again. Never imagined finding my “simple joy” would land me more VIEWS on a little FB video than Mark Zuckerberg has followers. INSANE. Find your “simple joy”! Good Day. Now Good Night. It’s all love. Earlier today Candace appeared on ABC’s Good Morning America which only 4 hours later has already been seen by nearly a half million people.